Happy Anniversary to Sharon Johnson. Her blog is one year old today. She has been such a huge inspiration to so many of us card makers. Her style is what truly inspired me to get into card making. I am so thrilled that I have been invited to participate in Sharon's 1 year Anniversary Party this next week. Be sure to check back on Tuesday to see my blog candy give away! The week + long celebration begins RIGHT NOW!!! Sharon has a ton of fun stuff planned — the first of which is today’s challenge. Today you have a chance to win a spot as a Stamp Simply Guest Designer! Read all about it on Sharon's site. Today’s challenge is Dancin’ with Dee!!! I have admired Dee's cards for months and I love how she uses the Kitchen Sinks 2 or 3 step stamps. I have a few of KS stamps, but I certainly haven't mastered the technique as well as Dee. 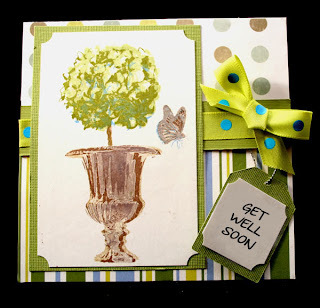 Take a look at some of the cards she has made using this technique. I used the 3 step Hydrangia Stamp set by Kitchen Sink to make my card for today. This was lots of fun to do and I just love the colors. Thanks so much for visiting me today. I would love it if you would leave a comment! Please go over to Sharon's blog to wish her Happy Anniversary and be sure to leave her a comment so you are signed up for the blog candy which is a stamp donated by Kitchen Sink. There will be 15 chances to win this coming week, so stop be sure and stop by every day! Beautiful card, Joan. Lovely design. I've made a card for Sharon's challenge and am waiting for my camera's battery to finish charging so I can upload it. I put a photo of a card on my blog from the set I bought from you, yesterday. I also gave you a "plug". this is beautiful! I love the colors:) Thank you for the dance! Joan, this is absolutely GORGEOUS!!! This set is, without a doubt, my FAVORITE of the Kitchen Sink sets -- I just love it -- and you have created a wonderful card with it!!! So glad to have you playing along this week -- thank you so muhc!!! Beautiful Joan!! Glad you are able to participate with us!! Your hydrangea is beautiful! Great job, and so glad to have you joining us this week for the challenge! Joan, your card is beautiful, I love the hydrangea set. I see you've used my favorite butterfly as well. What a lovely card!!! Thanks for sharing your beautiful, subtle, and sophisticated creation!! !